Huge Savings Item! Free Shipping Included! Save 15% on the Mohu Leaf Glide HDTV Antenna, Indoor, Amplified, 65 Mile Range, Paper-thin, Reversible, Paintable, 4K-Ready, 16 Foot Detachable Cable, Premium Materials for Performance, USA Made by Mohu at Home Entertainment Centers Online. MPN: MH-110925. Hurry! Limited time offer. Offer valid only while supplies last. 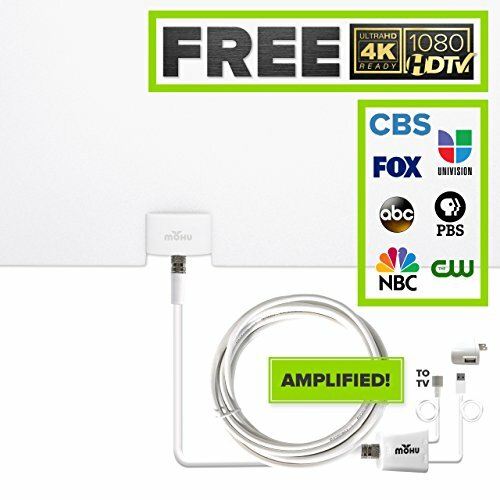 Soar into Free TV: Leaf Glide is the first of its kind HDTV antenna - enjoy the simplicity of an indoor antenna with the power of an outdoor antenna. Multi-directional Reversible and Paintable: no pointing" is needed reversible black and white design and is paintable to match any decorComes with included 16 foot high performance cable; HDTV Antenna Proudly Designed and Manufactured in the United States with a 1-year Warranty"
NOTE: Enables access to free channels only - does not enable access to paid channels such as ESPN/Fox News; Refer the Instructional Video from the Image Section and User Guide from the Technical Specification before use which is highly recommended. Before you buy, visit gomohu dot com backslash amazon to see what channels are available in your area.